Maritime Sunday is with us once again, happening to coincide with Greek or Eastern Orthodox Easter (known as greester here in Astoria) as well as the 100th anniversary of the well known Titanic disaster. That subject will be explored by everyone else, I suspect, so instead let’s check out the scene on the Kill Van Kull. 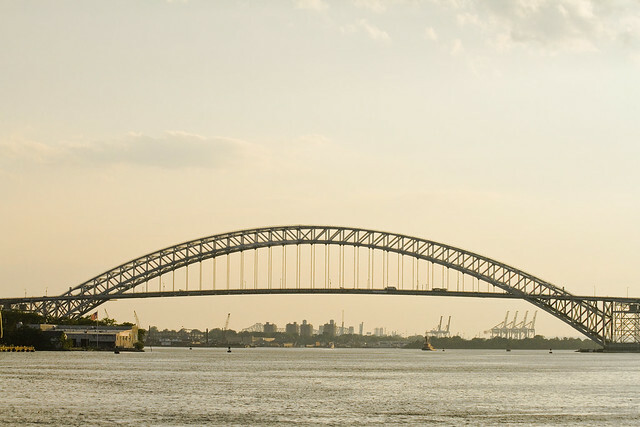 The Bayonne Bridge is the fourth-longest steel arch bridge in the world, and was the longest in the world at the time of its completion. 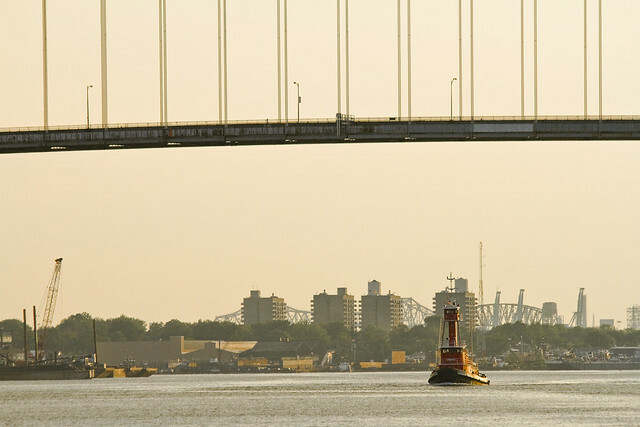 It connects Bayonne, New Jersey with Staten Island, New York, spanning the Kill Van Kull. Despite popular belief, it is not a national landmark. The bridge was designed by master bridge-builder Othmar Ammann and the architect Cass Gilbert. It was built by the Port of New York Authority and opened on November 15, 1931, after dedication ceremonies were held the previous day. These shots were captured while onboard one of the many Working Harbor Committee excursions I attended last summer, and portrays one of those summer days which New York is infamous for. Heavy clouds of humidity dangle, and inescapable temperatures render the entire archipelago in a tropical aspect. From this cauldron of wet heat emerged the vermillion hull of a Bouchard tug, the Frederick E Bouchard. It was returning from the gargantuan Port Newark complex, where it’s unknown mission seemed to have been accomplished. From his first voyage at eleven years of age as a cabin boy on a sailing ship bound for China, Captain Bouchard knew that shipping would be his life. 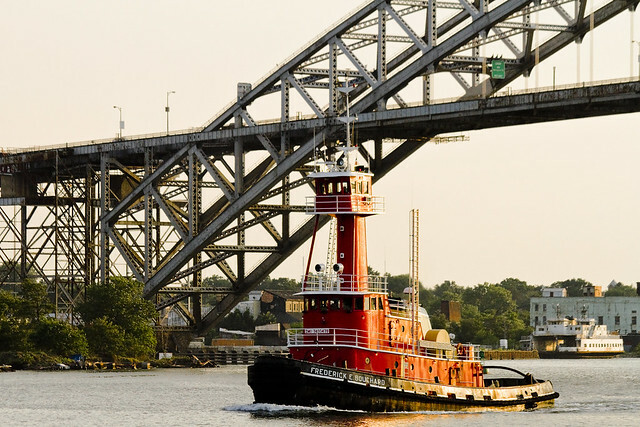 By 1915, he was the youngest tugboat captain in the Port of New York. On July 30, 1916, while on watch of the tug C. GALLAGHER of the Goodwin, Gallagher Sand Co., Captain Bouchard witnessed the infamous Black Tom Explosion, which detonated $22 Million dollars worth of WW I munitions. 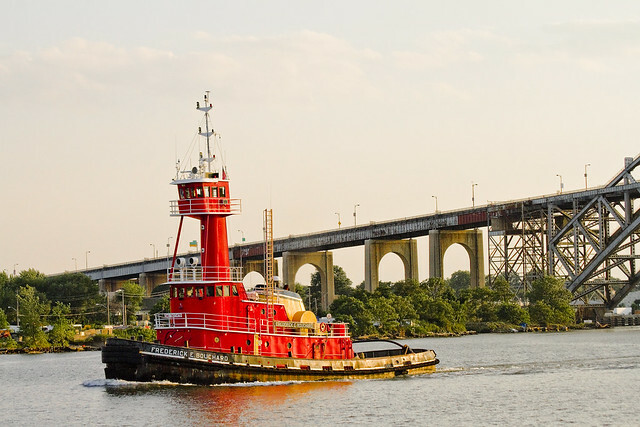 Always one to set out to accomplish what few others could, he took his tug from the Long Dock at Erie Basin in Brooklyn and headed for New Jersey. Amongst continuing explosions, which blew the glass panes and lights out of his tug, he worked to rescue the 4,000-ton Brazilian steamer TIJOCA RIO, and the schooner GEORGE W. ELEZY, of Bath, ME. Later the US District Court awarded the Captain a salvage award and an additional award for personal bravery, which totaled $9,000. He quickly invested the salvage award to create his own company, Bouchard Transportation Company, which was incorporated in 1918. A fairly large boat, for NY Harbor at least, the tug made good time against the tide. 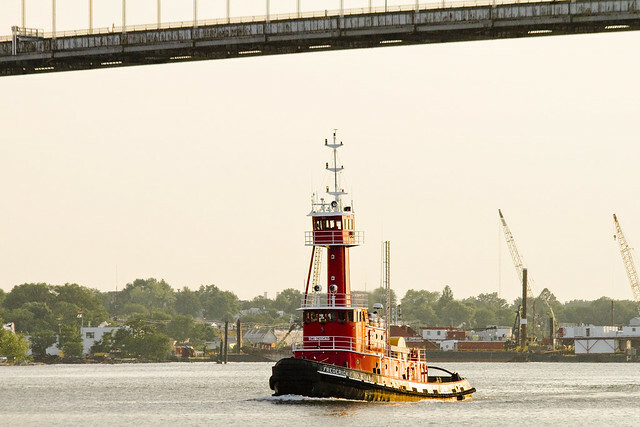 Models like this one are used by the petroleum industry to ferry fuel barges from point to point along the waterfront, ensuring that bulk delivery of “product” to local distribution depots happens in a timely fashion. Built in 1975, by Halter Marine of New Orleans, Louisiana (hull #437) as the Frederick E. Bouchard for Bouchard Transportation of Melville, New York. 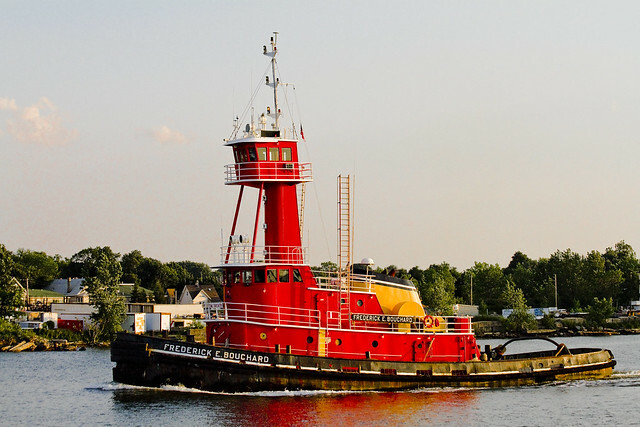 She is a twin screw tug rated rated at 3,900 horsepower. Omnivorous, of course, the Frederick E Bouchard has also been personally observed handling non volatile cargos as well. You have to stay busy in the maritime industry, and cargo is cargo. The actual nature of the cargo may change, requiring special handling dictated by custom and regulations, but at the end it’s physics and profit margin that define the mission carried out by maritime professionals. This is based on simple Newtonian physics. Newton’s first law talks about objects in motion stay in motion unless another force is acted upon it. In other words, if a boat is moving a 5 mph east and you were in the vacuum of space, it would never stop traveling east at 5 mph. However, we all know when we stop our engine on our boat, we slow down. How long it takes to go from 5 mph to zero, depends on wind, and current. Even if there was no wind or current, we’d still slow down, because the water itself provides friction upon the hull of the boat, and that in itself acts as a brake. We all have, by observation found that the bigger the object, the longer it takes to slow down. Newton’s second law of physics talks about how the amount of force required to move an object is inversely proportional to the mass of the object. So, if a tug and barge were traveling down a narrow channel, and you stopped your boat 1,000 feet away, right in front of the tug and barge; and, if the master of the tug saw you immediately; and if the master of the tug immediately began to stop the tug and barge; you’d have less than one minute to move your vessel. Because if you didn’t move your vessel in less than 60 small seconds, the tug and barge would just run right over you. It would be impossible for the master of the tug to stop, based of the collective mass of both the vessel and the barge, in 1,000 feet. The law of gross tonnage is un-relenting. It is a fact of life. What also is a fact of life, is that you should not depend on the master of the tug or any other large vessel is able to see you, either visually or on radar. As mentioned at the start of this post, today is Easter Sunday to adherents of the Eastern Orthodox church, but oddly enough, it coincides with a decidedly goddess based celebration which the Roman Empire celebrated called Fordicidia. In ancient Roman religion, the Fordicidia was a festival of fertility, held April 15, that pertained to animal husbandry. It involved the sacrifice of a pregnant cow to Tellus, or Mother Earth, in proximity to the festival of Ceres (Cerealia) on April 19.